Recommendations for installing a new electrical service in addition to some tips for an existing one. The quali ty of the power delivered to the home entertainment electronics will determine the baseline level of performance for that system regardless of the individual component costs. Noisy power lines, inadequate or improper grounding and poor Dynamic Transient Current Delivery (DTCD) can severely degrade overall video and sound reproduction capabilities. The following guide puts forth suggestions on how to create a high-performance power system that will ensure optimal performance for years of home entertainment enjoyment. Many of today’s A/V components have digital circuitry that relies upon a quality electrical grounding system to dissipate noise. A grounding system that has poor quality connections, corrosion or improper topology will cause relative high impedance to earth ground which will impact system performance negatively. The connection to earth ground starts with the grounding rod. It will be located just adjacent to the electrical junction panel. Physically, it is a conductive rod that is implanted in the ground providing the electrical return path to the power transformer, which provides power to the home. The grounding rod has a large gauge wire that is clamped to the rod. This is the primary ground wire that connects the electrical junction panel ground buss to the grounding rod. Inspect the rod and ensure that it is corrosion free and that the wire and the insulation have not deteriorated. If necessary, have an electrician clean and protect the connecting junction or have it replaced. Protective sprays as used for car battery terminals can be used to protect the junction. The soil itself can be a strong determinate factor in the ground noise level. In dry climates where the soil is sandy and the soil does not retain moisture, the ground impedance can be reduced by treating the soil in and around the grounding rod. Dig up the soil around the ground rod and replace the soil with good quality soil that is similar to what a gardener would use for a vegetable garden. Moisture retention within the soil is the goal. Regularly water the grounding patch for best results. Think of it as your home entertainment garden. Hire an electrician to tighten all the connections in the electrical panel. The subtle earth vibrations can, over time, cause the electrical connections to become loose. A loose connection can cause power line noise and decrease DTCD. Replace the circuit breakers that provide power to the home entertainment system. These can develop carbon deposits due to arcing when the circuit is tripped. Virtually all home circuit breakers are thermal breakers. There is another class of breaker called hydraulic electromagnetic breakers. They are very expensive and can only be used in certain types of electrical panels. Coordinate with your electrician and electrical supplier to attempt to obtain this type of panel and breaker. You only need to use the electromagnetic breakers on the circuits that power the home entertainment system. Common thermal breakers can be used for the other power circuits. Over-rate the power circuit. Install 20 Amp circuit breakers instead of the commonly used 15 Amp breakers. Even if your system does not require more than 15 Amps of current, the dynamic current headroom is valuable to system performance, especially when the home entertainment system has high power amplifiers. There are two phases of power in a typical home power system. When a home is built, the electrician will divide the individual circuit breakers so to create an electrically balanced load between the two phases. It is preferable that the home entertainment system is powered from the phase that has the least noisy components on it. Avoid fluorescent lighting, microwaves, refrigerators and other appliances that cycle on and off. Ensure that all electrical connections are tight and secure. Ask the electrician to come back in a few days to retighten all the connections. Copper wire is soft and pliable which will cause the screws to loosen up. The absolute best method to protect your home and valuable electronics is by installing a surge protection system at the electrical panel. Power protection devices work by shunting surge currents to ground. 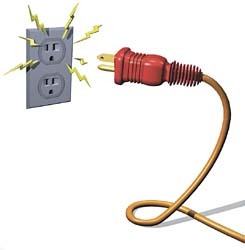 Locating the protection circuits at the power line entrance is more effective than putting a power strip or conditioner at an outlet where the added inductance of the circuits wiring decreases its ability to short surge current to ground. A surge that arrives at the electrical panel has only a few feet of grounding wire to the ground rod, so the impedance to ground minimal. Surge protection systems for the electrical panel are relatively inexpensive ($200-$300) and are simple for an electrician to install. Always use pure copper wiring for your home power system. Tell the electrician to over-rate the wiring gauge. Electrical code allows for the use of 14 gauge wire in a home power circuit. To over-rate the wire means that the gauge of the wire will be larger in diameter. In this case, it would be 12 gauge wire. Wire gauge numbers are inversely related to the actual size. So, a 10 gauge wire is larger than a 12 which is larger than a 14 gauge wire. It is preferable to use solid core wire as opposed to stranded wire. Do not coil extra power wiring in the wall or roof. Loops in the wire add inductance to the circuit and decrease instantaneous current delivery (DTCD).